For some time, I've been wanting to make a small battery-powered amp that would compete with my Pignose. That has been my main motivation for all the chip amp testing that I've performed over the past two or so years. 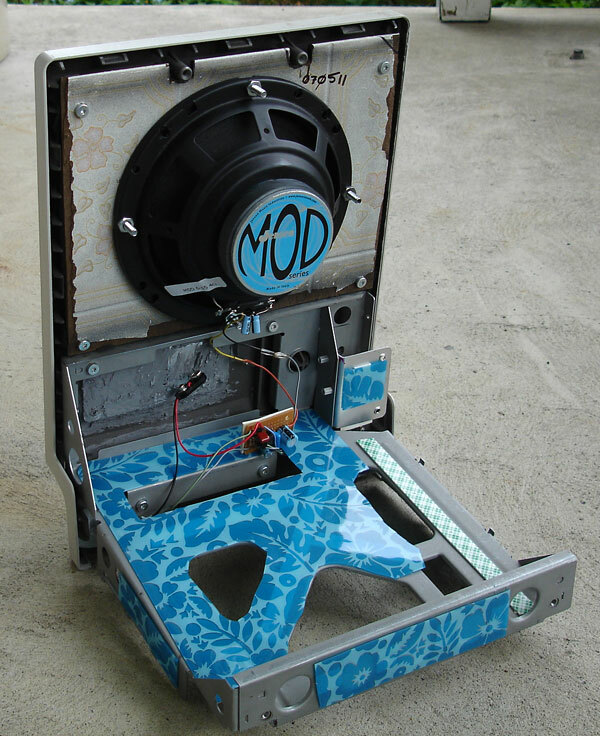 I had also purchased a pair of six inch Jensen MOD speakers for this project and a suitable cabinet was nearly as elusive as the right amp. Last weekend, inspiration hit me. 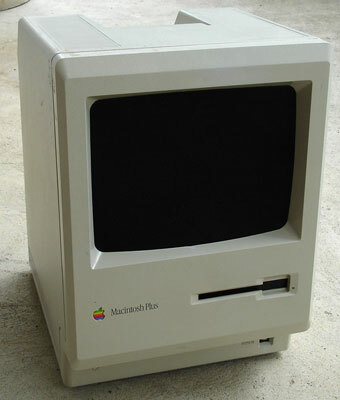 I remembered the Macintosh Plus upstairs that I'd saved from the local high school's trash heap. The Mac was fully functional, but was more of a sentimental novelty that was collecting dust. On the web, I've seen countless aquariums built from old Macs and it seemed that using one as a small combo amp may be possible. I brought the Mac downstairs to my bench and when I held one of the speakers up to the monitor, it looked like it would fit. I then set out to remove the internal components of the Mac. The front and back of the Mac are fastened by five Torx screws. The first three were easily removed, but the two underneath the handle required a very long screwdriver that I didn't have in my toolbox. At a Mac aquarium construction website, I found a tip to make your own long shaft screwdriver with a ball-point pen. It worked perfectly and the case was then open, allowing me to then remove the circuit boards and CRT quite easily. I didn't save anything except the brightness control knob (and the original RAM, for some nostalgia), hoping that it could be used with the volume control. As expected, the Mac used a steel frame for the disk drive and circuit board mounting. I needed to retain the frame, as it also holds the two pieces of the case together. The frame is screwed to the front case, then the back case slides into grooves of the front, with the rear screws then attaching the back to the frame. The rear of the Mac had a number of cut-outs for peripherals and the power supply. I filled some with plastic epoxy and others I used a metal plate painted flat black, affixed to the inside of the case. I also used metal plates for the disk drive slot and keyboard port on the front of the case. There were a number of vents in the case, which I either taped over from inside or filled with epoxy. I constructed a baffle with Masonite hardboard left over from a previous cabinet construction attempt and painted the front flat black. 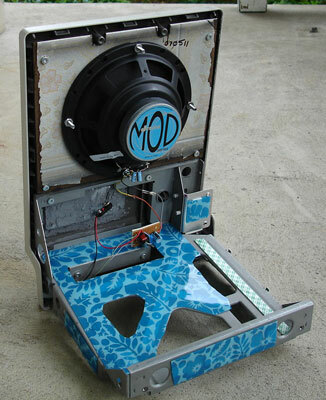 After I attached the baffle board and speaker to the front case, I slid the back case on to test the sound. The metal frame was resonating at certain frequencies and I knew that it would need dampening. I used a vinyl placemat and affixed it to the frame with double-sided foam tape, which deadened the vibrations. Next, I made an L-bracket to mount the volume pot and bolted it to the frame. Coincidentally, the recessed keyboard port had the same width as a Marshall-style jack nut. I drilled out the metal plate to receive the nut and mounted the jack. I wired in my Ruby prototype build, removing the Gain pot in the process. I added a 5uF non-polarized cap across the speaker terminals to filter out high frequencies, since the small speaker's response can be a bit bright. Finally, I needed some sort of grille to protect the speaker. I used some coarse metal screen, stretched grille cloth over it, then sandwiched it in place between the front case and baffle board. The resulting amp sounds terrific and has a nice form, while retaining the sentimental novelty that led me to originally save the computer. I have yet to wire the DC jack and I may make the offboard wiring modular so I can try out other chip amps, but for now I'm very happy with the success of the project. I'm currently powering the MacRuby with 8 AA batteries, but have been considering the use of a gel cell.